Henry Glass Fabrics: Let's Get Quilting - a 16 pc. Vintage bundle by Mary Beth Baker! Who doesn't have time for wine? Let's Get Quilting - a 16 pc. Vintage bundle by Mary Beth Baker! Who doesn't have time for wine? Wine time! Or is it whine time? Either way, you can cry if you want to, but this beautiful 16 pc bundle can be yours in this week's giveaway. 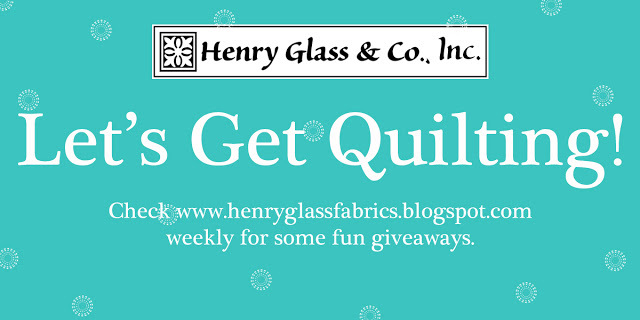 Come like us on Facebook, comment on this blog, or give us a visit over at @HenryGlassCo on Instagram. Wherever you happen to be, LIKE us, SHARE us, and this bundle could be YOURS this week. My husband would love a quilt made from these prints. Such fun fabrics! We live close to a wine producing area and this would make a great quilt for the family or placemat set for my kitchen! Beautiful fabrics. I can think of several projects that I can use this fabric. Placemats, napkins, and tote bags are some of the things to come to mind. Oh, so lovely! I have several people on my gift list that would enjoy items made from these fabrics. Love these colors - beautiful! I especially love the little wine corks! My sister will like me making projects for her with these. All my kids would love something made from this fabric line! All are adults of course. Love this fabric!! Would be a great gift for my sister--maybe a table runner or a bag. She absolutely would love it! The cork fabric is the best! I've got so many ideas running through my head that I could make with this fabric! This fabric is sew cute. My daughter-in-law would really like this fabric for a cute throw. Thanks for the great giveaway. What wonderful colors and prints. Hope that I'm a winner! Thanks! I think these would make some wonderful placemats and potholders. I see a Christmas present. Such colorful and fun fabrics. Lots of potential for Christmas gifts. I love the colours. I need this fabric. I like Cabernet Sauvignon. Do you know how many wine cozy's I could make with this collection!!! Eeeep! Thank you for a great giveaway. my winey friends and i NEED this fabric. thanks for the chance to win. What a lovely collection! I'd be able to make some perfect gifts for the wine lovers I know. Beautiful fabrics and most timely. My friend got married recently and I wanted to make her and new hubby a quilt. They are both wine drinkers... her bridal shower was a tour of wineries with the girls on a party bus! I know they would love a wine themed quilt. This fabric is awesome! Two of my favorite things - fabric and wine bundled up together. Thanks! I love this fabric. I would love to win this. I have the perfect runner to make from this. Thank you for your wonderful fabric. Beautiful fabric that would be fun to create with! This is a GORGEOUS collection! I can't wait to get my hands on some and make something beautiful for my kitchen! Who doesn't like wine?! Beautiful fabric!